The quest to lose weight seems never to get old. Whether it’s a lifelong journey or just the desire to drop some post-holiday pounds, new diets are created, embraced, and discarded while the search for the right one goes on. 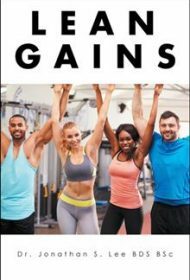 In Lean Gains, author Jonathan S. Lee offers a comprehensive approach to dropping fat and replacing it with muscle. It’s rigorous, science-based, and-—hallelujah!—you don’t have to live on grapefruit alone to make it work. Lee studied nutrition in college and later became a dental surgeon. He notes that he has “always been fascinated with medicine, sports nutrition, and the physiology of the human body” and has spent years in the gym and nutritional world. The author breaks down the ways that hormones influence weight gain and offers dietary tips that men and women can use to influence estrogen and testosterone production. Men with high estrogen counts tend to gain fat in the hips and breasts, while women with more testosterone may develop a shelf of pectoral muscle and lose a cup size or more; it can be tricky to find the sweet spot that leads to the shape you want. The book is jammed with details but nicely broken up with clip art so the science doesn’t get overwhelming. Crisp paragraph breaks and a gentle sense of humor make for quick, enjoyable reading. The diet tips are really secondary to strength training, and there’s a detailed discussion of workouts here that takes the form of an extended pros and cons list, noting why certain types of exercise can offer more lean muscle mass gain than others. Lee outlines his own workout, and it’s sufficiently detailed that readers can choose to adopt it outright or modify it to better suit their personal goals. Well researched and meticulously written, Lean Gains offers valuable insight into the science of weight loss.